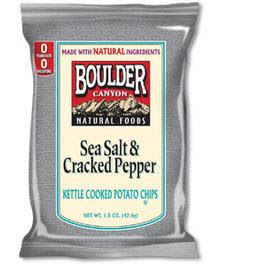 Boulder Canyon makes a great line of gluten free chips (that are marked gluten free)! All flavors EXCEPT the Malt Vinegar flavor are gluten free. They are available at your local grocer (I bought mine from Ralph's) and are really delicious. You can also purchase them online through the website provided below. Look for the gluten free marking both on the front upper left of the bag and the back by the nutritional information.